Invaders World Tour, MeYuMe’s take on the classic game Space Invaders for the iPhone, iPod touch, and iPad, is placed in a patriotic setting reminiscent of Independence Day. You are required to defend our national colors against an onslaught of intrusive aliens that emerge from the sun in an army that includes green monsters with massive teeth, purple octopus looking creatures, and ones that look like potted plants. They descend upon Earth in a line of four, bombarding you with rockets, lasers, and other such devices. 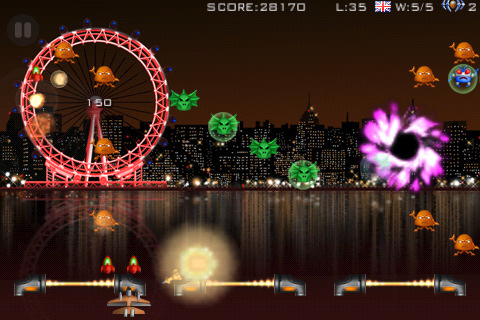 Your job is to detonate the aliens before they reach the ground level, where you shoot from. Even if you don’t destroy them in time, you are “cleared” from the level and move on to the next, which doesn’t appear any different aside from a change in color scheme and a new variety of aliens. The backdrop is a skyline of New York City including the Statue of Liberty and the Chrystler building, while the Twin Towers are conspicuously missing. Depending on which alien you destruct you are allotted a certain number of points. While, admittedly, any space invaders game can get monotonous, this one is especially so. What I like is the dramatic scene that plays out if you don’t clear a level. The aliens retreat to the sun, leaving behind an apocalyptic New York, destroyed and on fire. The sound effects for this game are great, as are the graphics. It really annoyed me that your controller, or “space ship,” can not move from side to side unless tilting the entire device you are playing on. While you are not stationary you are only able to shoot fire from the far corners of the screen unless you’re perfectly balanced in the middle. A perk of the game is that you can share your score directly online, adding a competitive edge to the game and a sense that you are playing among others. The layout and general feel of the game also give it an old school vibe, like you are playing at an arcade. I grabbed this game while it was free, so it is not the worst thing in the entire world. Now that the price is back up to $0.99 if you’re hell-bent on saving the US this game is perfect for you. AppSafari review of Invaders World Tour was written by Renata Paszterko on July 22nd, 2010 and categorized under Action, App Store, Games. Page viewed 3782 times, 3 so far today. Need help on using these apps? Please read the Help Page.